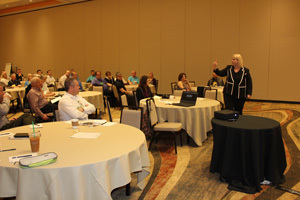 AAMA was pleased to host body language expert Janine Driver as the keynote speaker at the AAMA 80th Annual Conference in Phoenix, Feb. 12-15. 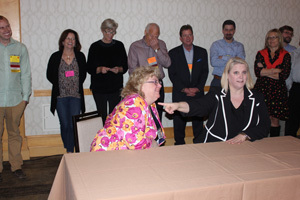 The American Architectural Manufacturers Association (AAMA) was pleased to host body language expert Janine Driver as the keynote speaker at the AAMA 80th Annual Conference in Phoenix, Feb. 12-15. Driver, praised as an expert by Anderson Cooper and featured on the TODAY show, gives instruction on understanding nonverbal communication. During the conference, she shared tips on how to read and use body language to develop and maintain good relationships with customers. "I'm here to prove to you that of everything you put on today, what will be judged the most is your body language," said Driver in her keynote address. In addition to this, she held two supplementary workshops during the event. Driver shared that fMRIs show that, when evaluating brands, consumers use emotions rather than information to make decisions. Even just a couple minutes of interaction can make a big difference when it comes to your body language. Understanding body language is just as important as putting it to use in your own actions. For example, the use of crossed arms is often misinterpreted as boredom or defensiveness. Instead, Driver said it often indicates that a person is thinking. Still, know that standing with arms crossed is likely to be misconstrued, so keep this in check. Driver emphasized the importance of asking your customers questions. If you sense they may be withholding information, intentionally or otherwise, gently let them know you sense there may be something they're not saying. Then, stop talking and wait. "This step of due diligence is very important," said Driver. "WAIT stands for, Why Am I Talking? Ask questions, then WAIT. Think like a CIA operative and investigate when something in someone's body language is inconsistent with their speech." When greeting customers, face your body toward the person you're shaking hands with. It's easy to accidentally give them the cold shoulder with your body language, according to Driver. To aid in being perceived as important, "Frame yourself to fame yourself." If you appear in the center or near the center of group photos, you'll be perceived as important. Additionally, when entering someone's office, use the door frame to your advantage by casually leaning against it. In a separate workshop, Driver shared additional information on how to keep customers for life by using both visual and auditory information processing. "Pay attention to how many words someone uses when answering a question," said Driver. "Talking too much is a stalling tactic." She added that using the word "obviously" in an answer is suspicious. If something were obvious, you wouldn't be asking the question. Along those lines, Driver advises against saying, "Can I ask you a question?" because it signals to the person you're talking to that you're about to ask them something negative. In conducting statement analysis, the words themselves are three times more valuable when someone is lying to you than body language will be. Driver also advised participants on how to come back from a mistake with a customer. First of all, your excuse for doing something wrong cannot be longer than your apology for doing it. Stick with two phrases: "You're right" and "I'm sorry" when an error is made. Use more words apologizing and fewer trying to justify your mistake for good communication. "Customers want to be heard," said Driver. "Validate their words, and don't try to make excuses." Driver showed some video examples of interviews in which subjects give themselves away through their facial expressions and body language. Some tips she shared is the concept of "Duping Delight" used to describe when a person smiles through a deception. Yawning and even burping indicate an increase in stress going on in the body, said Driver. Touching or rubbing one's nose could indicate a spike in stress, and if someone has their thumb inside their fist, they need reassurance. Some final sales tips Driver offered included knowing customers' favorite hot beverages -- hot, not cold, as the concept of embodied cognition calls for better results with warm drinks. "Also, you want your customers in the most comfortable seats possible," Driver said. 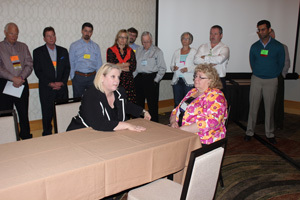 In conclusion, Driver told those at her presentation and workshops that they shouldn't just take notes today and then try to put this into practice when meeting with clients -- they need to think about body language all the time. "You need to practice like you play," she said. More information about AAMA and its activities can be found via the AAMA website, http://www.aamanet.org.